Via Ferrata or the “Iron Way” is a more or less difficult mountain hike where the most difficult sections provide steps or rungs and a safety cable. Many of these paths are full of such supports due to their steepness and degree of difficulty. 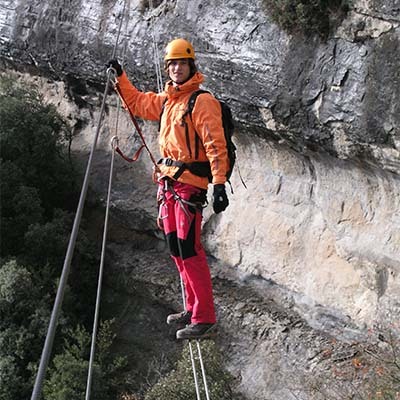 Nowadays there are more via ferrata as a result of the boom in adventure sports and recreational companies, municipal governments and other institutions have realised their potential and have started to invest in them. This has been particularly noticeable in Andorra, Aragon and also in Catalonia and, for this reason, via ferrata climbing is now an attractive and safe sport whose challenge and element of risk appeal to modern men and women stressed out by their commitments and busy lives. *2 guides per 14 participants.